Ladies and gents, I request assistance in making a valuation of the above set. Pleas let me know your thoughts. Includes the Yoda, or just the 9493? For the set itself, that is easy, $140-150. For the bit of paper wrapped around it, who knows? It depends who you can convince to buy it. 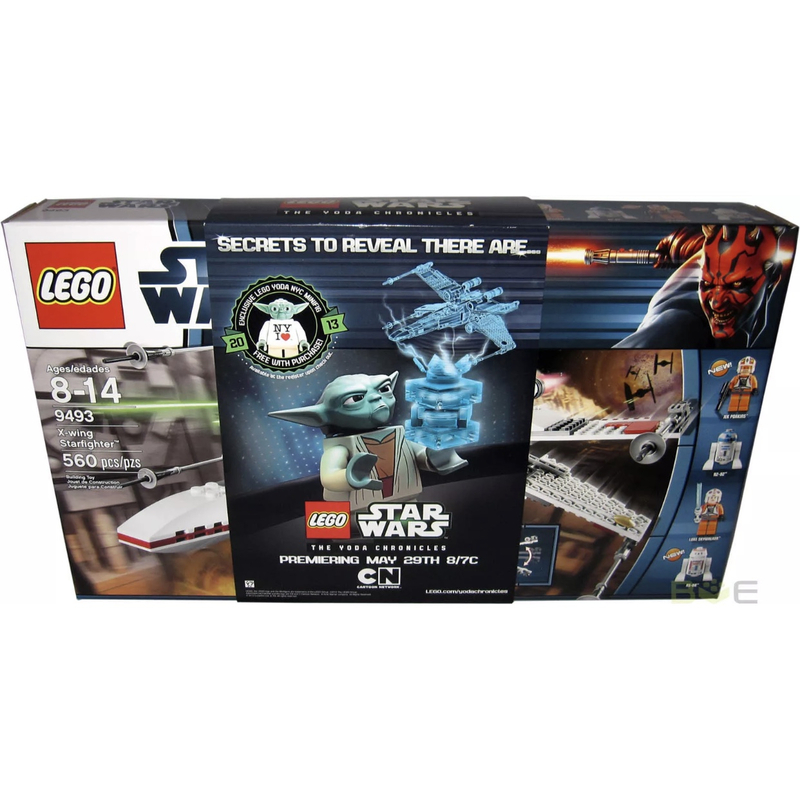 But it will be worth much more if it comes with the Yoda minifigure too. I have seen that there are 1,000 of the set with the promotional sleeve. Sorry to tell you but it's worth nothing. Seriouly though Bricklink has the set (without the outer sleeve) averaging at £106. Couldn't find any with the sleeve but that may make it more collectable. Of course, If you have a sealed New York Yoda to go with it, that increases the value considerably. I mean, did it sell for that? I can list my left shoe for a trillion dollars but that has no bearing on its value. Why not conduct an "auction" style listing and start the bidding at $.01? Let the bidders sort out how much they're willing to pay for it instead of you telling them (in a Buy It Now). Then your sold price will be exactly how much someone is willing to pay for it (aka, what it's worth). It tells you what people aren't willing to pay, so gives an absolute ceiling value. There is no way the sleeve is worth over $800. 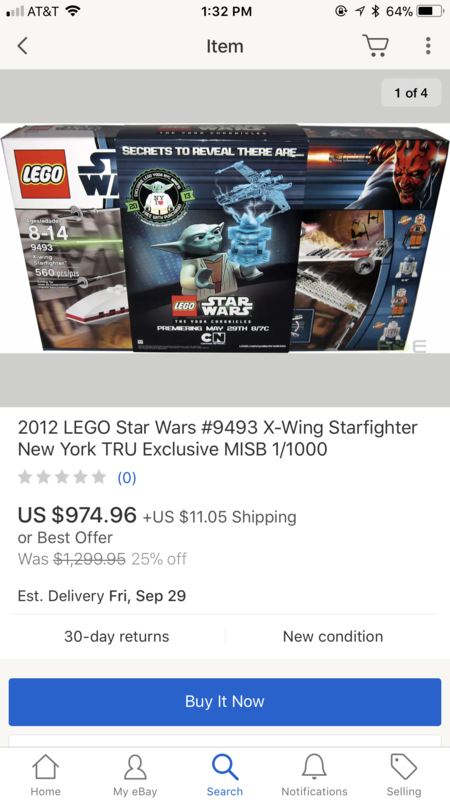 Even with the Yoda figure that price is an absolute joke. I think I can perhaps give you the best valuation. I purchased about 10 Yoda + X-Wing Slip + Packaging when they were first released. I sold them all over a few years at a decent clip for about $350 each. The YODA was what people were paying for, not the X-Wing Slip. In my opinion, $325 was for the YODA at the least, and $25 was for the slip (at the most!). The X-Wing Slip probably adds $25-$50 to the set... and you'll still be hard pressed to find someone that even wants it at that price. I have a left over X-Wing Slip and there's no way I'm listing it for anywhere close to $1,000. I think if I listed it today with a $25 markup over current eBay prices, it'd still sit until some random person decided it was worth a few extra bucks to get a little band around their set. Sadly, for us both, it's nothing really special or worth anything over your normal set. wow! I had missed out on it back when it was out. That is so cool! What is the over all box shape?